I’ve told you guys about my good friend Tiffany before. Real life friend not online friend. She and I have known each other since we were in the 6th grade. I adore her. She is very creative when feeding her large family. We love bouncing recipe ideas off of each other. Especially inexpensive meal ideas. Well back when the twins were babies I remember being at her house one afternoon and she was making Baked Catalina Chicken. 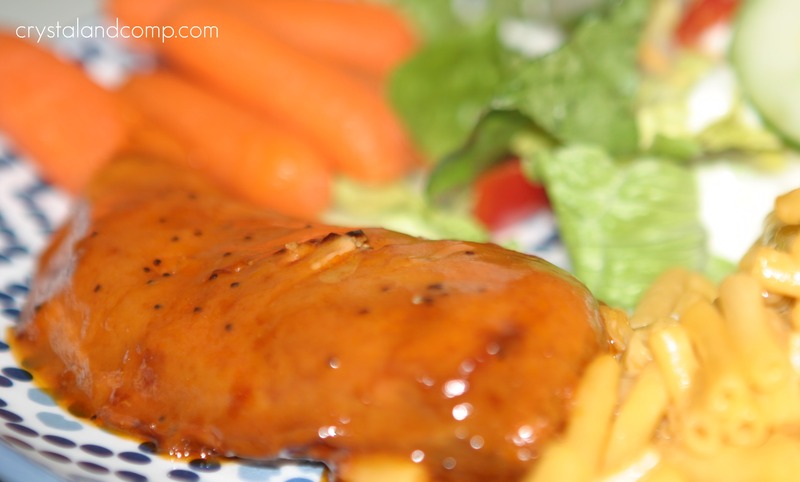 I had used salad dressing before to cook or marinate chicken, but I had only used Italian dressing. Nothing adventurous like Catalina. This chicken had amazing flavor. Recently I was thinking about that chicken she made and I knew it could be recreated in the crockpot. Now there are a few Catalina varieties on the shelves at the supermarket. I grabbed a Honey Catalina flavor. It has poppy seeds in it. Yum! Dinner does not get any easier than this- two ingredients. As usual I threw mine in there frozen. 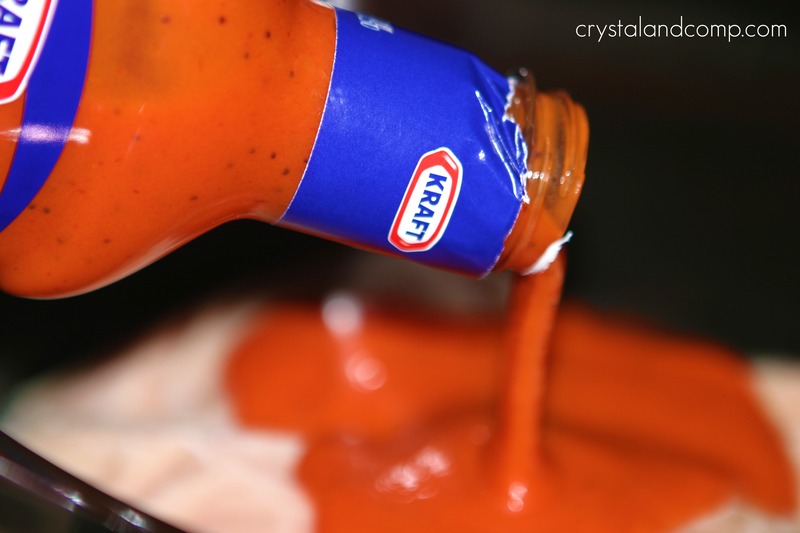 Pour the bottle of dressing over top. Coat it evenly and then pop a lid on it. Cook it on high for about 6 hours or on low for 8-10 hours. This has amazing flavor to it. A little sweet, a little tangy. A lot good! I served it with macaroni and cheese, dinner salad and baby carrots. Let me know when you make it. I know you are going to love it. 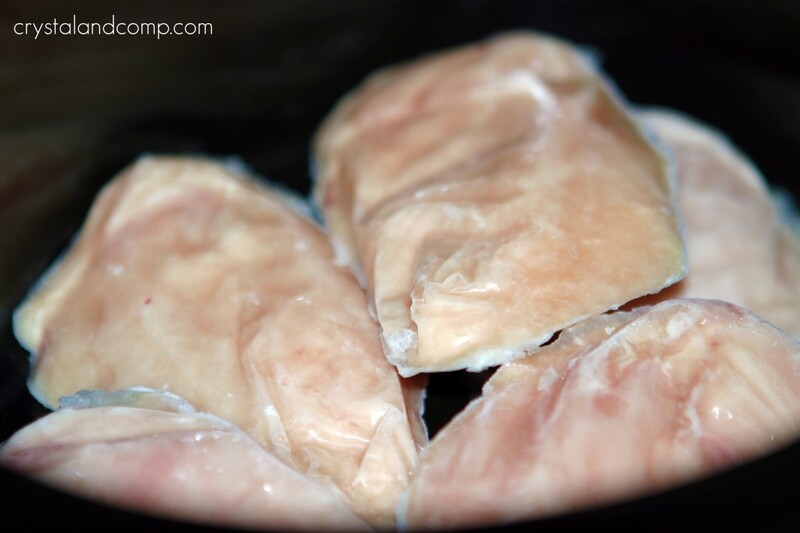 You could certainly bake it at 350 for about 30-45 minutes depending on the size of your chicken breasts. I am sharing this recipe on these delicious sites: i heart naptime, the girl creative, C.R.A.F.T. craftomatic, crafts keep me sane, skip to my lou, making the world cuter, a southern fairytale, sumos sweet stuff, mad in crafts, tip junkie, tasty tuesday, tempt my tummy tuesday, craft edition, hope studios, todays creative blog, sew much ado, someday crafts, we are that family, blue cricket designs, somewhat simple, paisley passions, house of hepworths, fun to craft, fingerprints on the fridge, tidy mom, a few of my favorite things and it’s a hodge podge life. Looking for a more copious list? Here are over 50 sites to search for and share projects and tutorials. That sounds super! Great idea! Shannon recently posted..Mommy Club – Wednesday Linky Up! Thanks Shannon. Let me know what you think if you give it a try. Oh I am trying this tomorrow. I have company coming in for Thanksgiving weekend and want very easy meals so I can spend more time with family. This sounds perfect, thank you for posting it. Can’t get easier than that. Looks delish. Thanks for sharing. I would love it if you could link this up to our linky party going on right now. Sounds great is there any vegetables that would be good to add to the crockpot with this? I always try to add veggies to crockpot recipes never had honey catalina dressing so not sure what would go good with it? Oh, this looks great. We do the same thing only with Italian dressing. It’s especially good on the grill, but I’ll have to try out the crock pot. I do the Italian dressing too. So easy. Really, there are so many possibilities with meats and salad dressings. 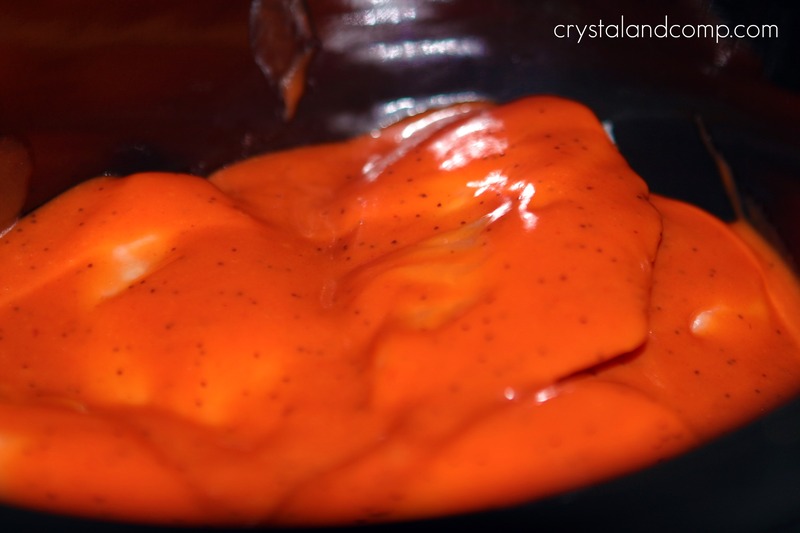 Many of them make excellent marinades. Thanks for checking out my recipes! I have this in my crockpot for dinner tonight. Can’t wait to try it. I love that dressing on veggies and salads. So, I imagine on chicken it will be delicious! Ugh! I bought classic catalina, it was the only one stop and shop had and I couldn’t remember if there was a different type when I was there. I got home and realized I needed sweet honey!!! Is there anything I can do to dr this up? Or just do it was classic and hope for the best? Lol I was thinking maybe a little vinegar and brown sugar?? I’m not too sure what the sweet honey tastes like so I’m really just guessing here lol! Use the classic version. It will work just fine. No worries. I am dumbfounded at how AMAZING this recipe was!!! My entire family loved it, this was the first time in AGES that I didn’t have to ‘battle’ with my son to eat is food. Thank you a thousand times! Yay! How exciting. Thanks for the feedback. IS THIS RECIPE MEANT FOR CHICKEN ON THE BONE ONLY OR WILL IT WORK FOR BONELESS BREASTS?